He's just sleeping off the tail end of anaesthetic having had his teeth trimmed. There are some deeper issues there, but his teeth not wearing normally was the thing needing the most urgent attention as it was preventing him from being able to eat properly. 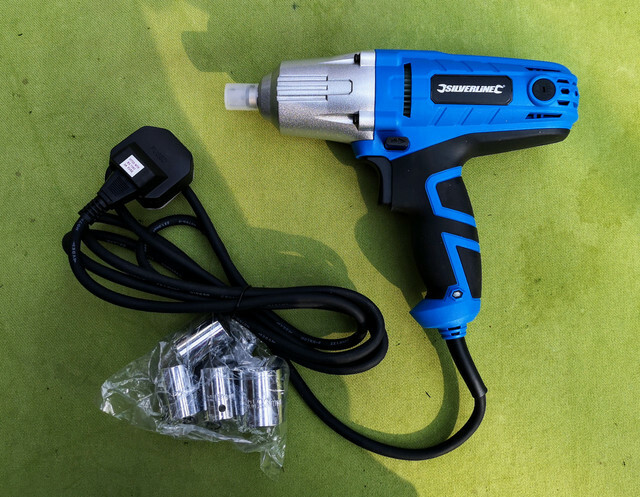 It is reassuringly heavy, and with a rated torque figure of 350NM it should hopefully be sufficient to get the pulley bolts out of the Invacar. I think if that doesn't do the job, next step will be to pull the engine and gearbox then just take the gearbox to my usual garage to be sorted. Having just got the engine running well it would be annoying to have to pull it out again! 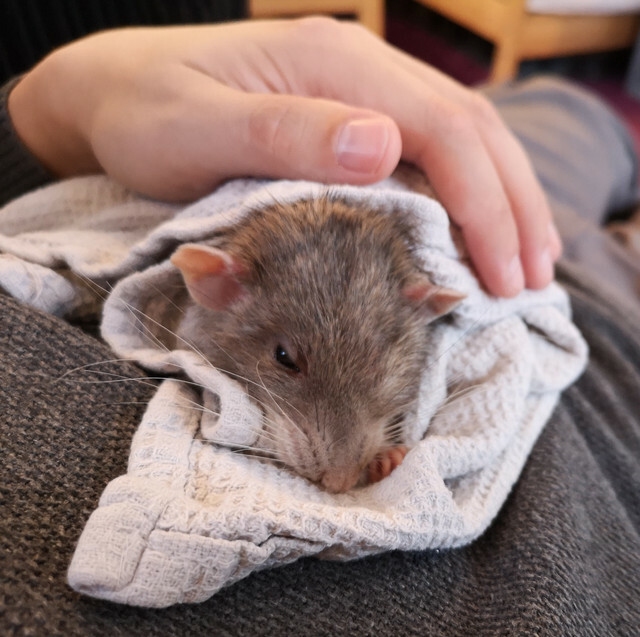 Rats make pretty good pets, don't they. I used to raise them, a lifetime ago. One of mine started having babies of a color strain that, while known, hadn't been seen around the area where I lived. Instead of the usual white, or black or grey, or some combination pattern of those, mine were a pale tan, or tan and white. They had the pink eyes seen in all white rats. pretty color though, and they bred true. Rarely if ever got a black or grey out of them. They're really good pets. I honestly never would have believed that they could have such distinct personalities until I spent the first few months living with them. The downside really is the tragic brevity of their existence. Think when these two remaining boys pass on we will hold off getting any more for a while. Doesn't really feel we can give them as much time these days as I feel they deserve, especially as we have the dog which makes letting them have free run time trickier. I've fancied having some crested gecko a for a while as they do such a good job of being the comedy sidekicks of the reptile world...plus are really easy to care for once you've got everything set up right. Looked after they should live a decent chunk of time too so long as you're not massively unlucky. 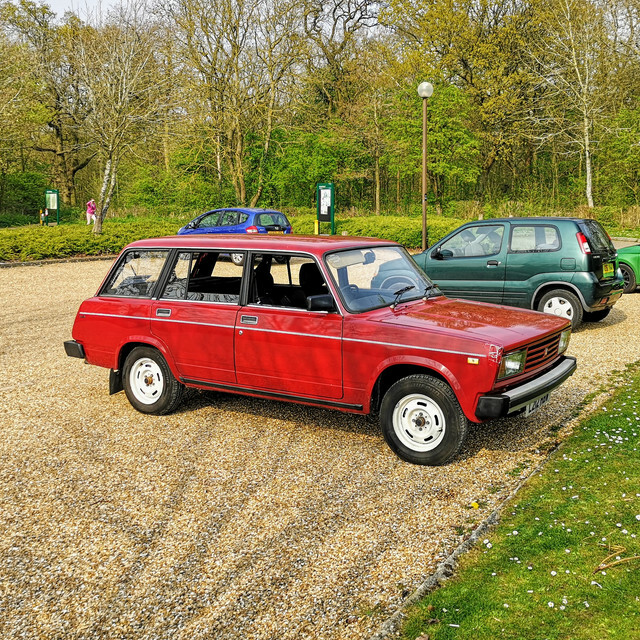 A Lada has windows that open? And, if opened they reclose? I like the way rats are laid back. I started with hamsters because gerbils bite, only to find that hamsters bite, and a lot of times worse. Never got bit by a rat, even a momma with babies. I found it funny that a female rat will run on a wheel for hours at a time, while a male will run a few minutes, figure out he's going nowhere, and go chill out. He'd rather climb around on your shoulders and see if he can get a treat from you. Only thing cute about hamsters is watching them pack their cheek pouches full of stuff to carry off and hide. Greedy little things. Strange seeing people talk about Rats as pets, I always kind of pitied them in pet stores, They were being sold as pet food for Snakes. So the task for this weekend is as far as possible to bash our way through the list of stuff the van needs for an MOT. Let's start out with some low hanging fruit. The nearside headlight reflector is sufficiently tarnished to result in there being zip by way of a beam image. Usefully a brand new headlight was found in a box in the van, so I fitted that. The old one doesn't actually look too bad surprisingly, but it was utterly failing to do anything by way of actually directing light in a useful direction. Beam height will need adjusting obviously but that can wait until it's pointing the other direction so I can use the garage door, which I think still has marks on from when I adjusted the headlights on the Saab about four years ago. 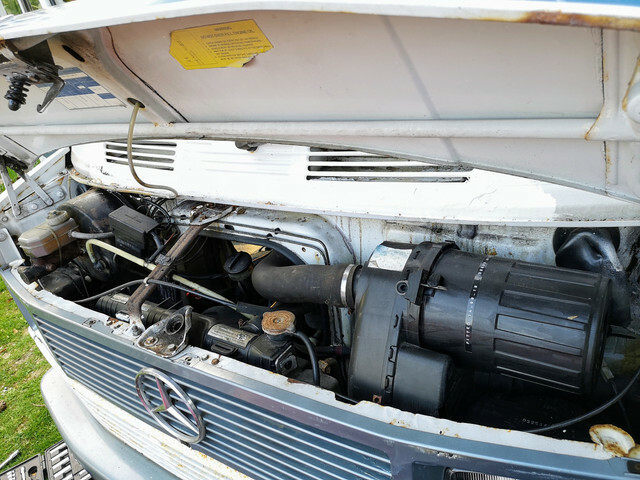 The next thing on the MOT list was to eliminate a minor fuel leak. 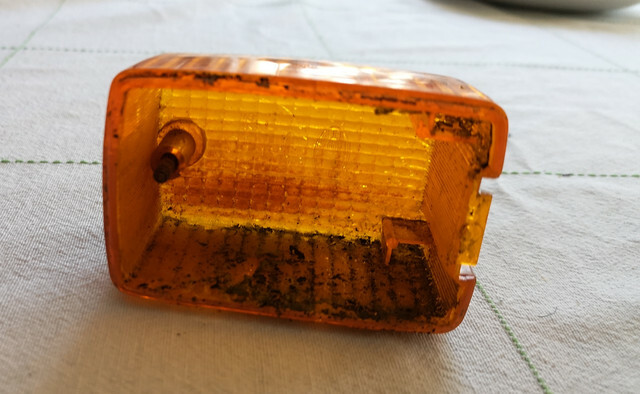 There was a very slow drip from the return line to the tank with the engine running, emanating from somewhere up between the fuel tank and vacuum reservoir. This was quickly traced to this pipe joiner. It was utterly disinterested in gripping the fuel pipe firmly no matter what I did. 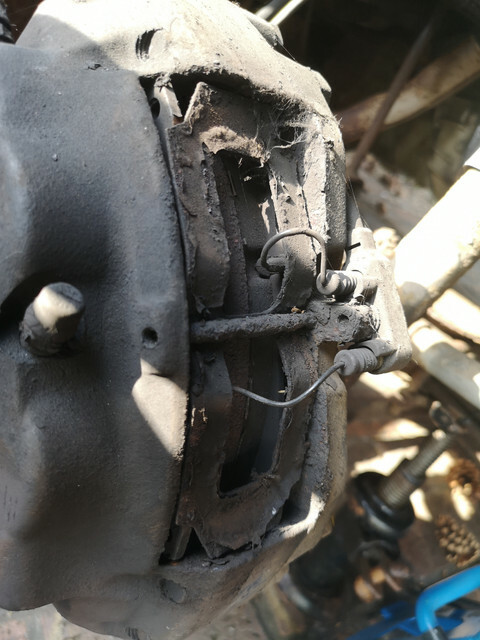 So it was removed, binned and a short length of 5/16" fuel hose was slipped over the join between the two pipes instead. While I did get diesel in my hair this was another quick job, fuel tight and tested after less than ten minutes. There is a new exhaust on the way. 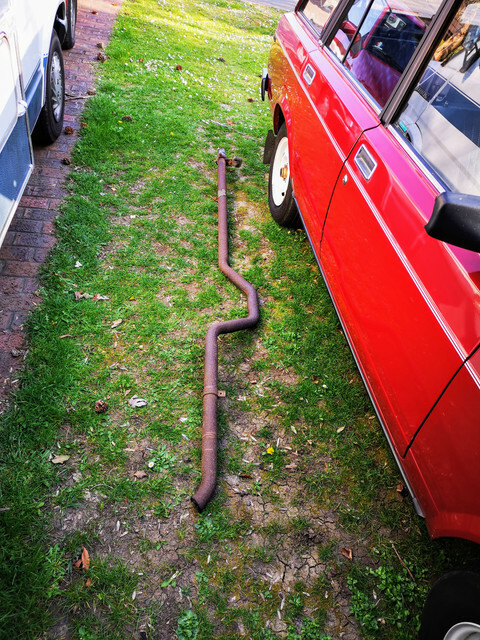 Unfortunately this is a slightly different type to the one the van was previously fitted with (I was struggling to find anyone who actually had that in stock), so the downpipe and tailpipe of the old system would need to come off. My original plan had been to retain those until I got around to having a bespoke stainless system made for it. Thanks to decent quality fasteners it only took fifteen minutes to get the tailpipe off. 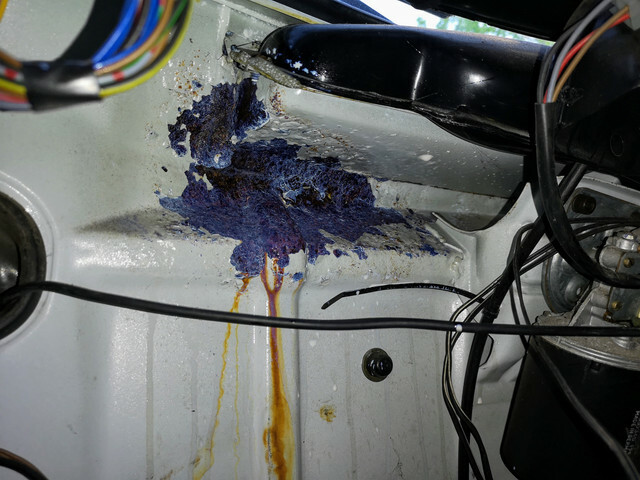 It's seeing stuff like this which really highlights how much longer the van is than most cars. This whole stretch will be removed once the bespoke system is made - given the weight of this that can only be a good thing. 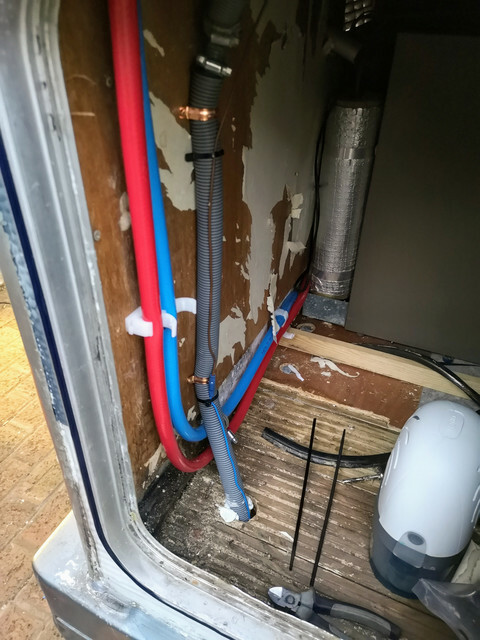 I'm not removing the downpipe and expansion box (which is only loosely bolted on just now) until the new system arrives as that will essentially immobilise the van. I have doused the manifold to downpipe bolts in Plusgas though. There were a number of things in the van which didn't work when I got it. Among those were the marker lights above the cab. I want to resolve that. This is where I went off on a merry old dance. After approximately an hour the cab had ended up looking like this. This was all going on because I was peering into the bowels of the wiring loom trying to figure out where on earth the feed to those lights was meant to come from. 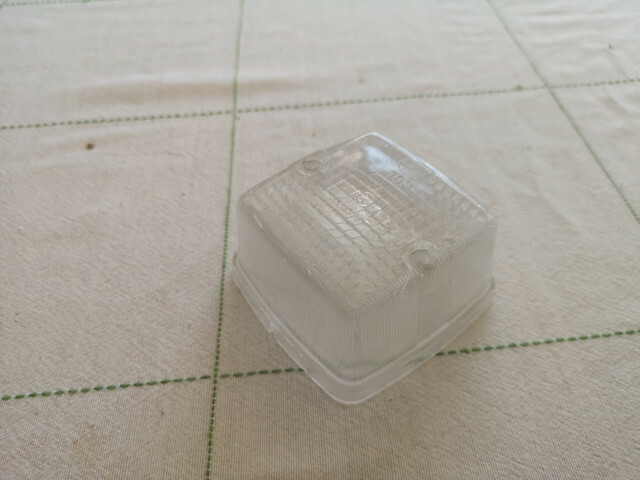 I had found two fuses in the fuse box which were labelled as marker light (well, they were actually labelled in German but not hard to translate). However tracing the conductors from there proved exceedingly difficult, and I couldn't figure out how they got into the space above the cab. 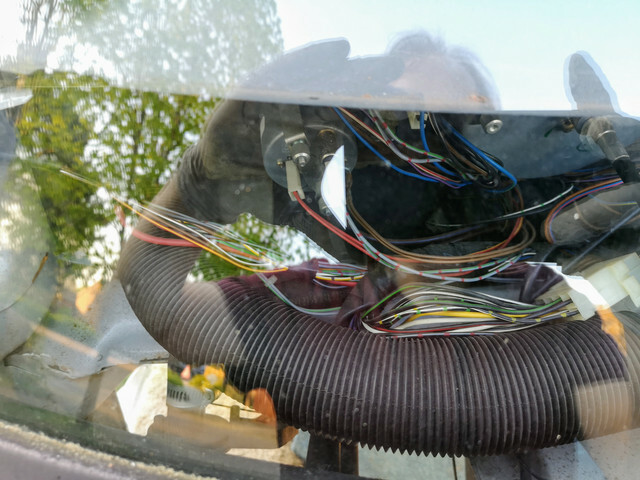 After wasting not an insignificant amount of time dismantling the cab, I eventually tracked down a total of five wires heading up into the windscreen pillars. All of these were accounted for as part of the interior light circuit. Cue much more head scratching. Eventually after several times longer than it should have, the penny dropped. 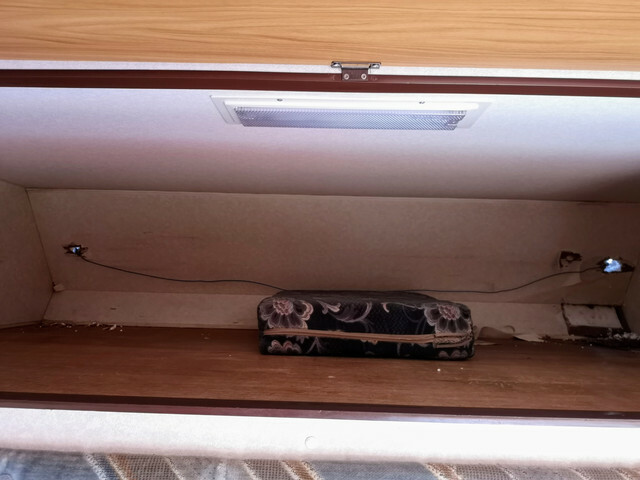 It was highly unlikely that AutoTrail were going to have messed with the cab wiring...they stuck some carpet and fancy velour in there, but they didn't faff with the wiring. Surely these couldn't be anything to do with the marker lights way up front... surely? Well let's find out. One was a solid ground connection...the other wasn't...so let's stick 12V down it and see what happens. Seriously?!? Awards for the most ridiculously unnecessarily circuitous route for wiring to feed a couple of lights? Annoyingly the feed which I suspect to be for the nearside one is now safely terminated and buried behind the bathroom wall...the wall I just finished building and finished tidily. Argh! I am not pulling that all apart again if I can avoid it - especially on the clock like this. 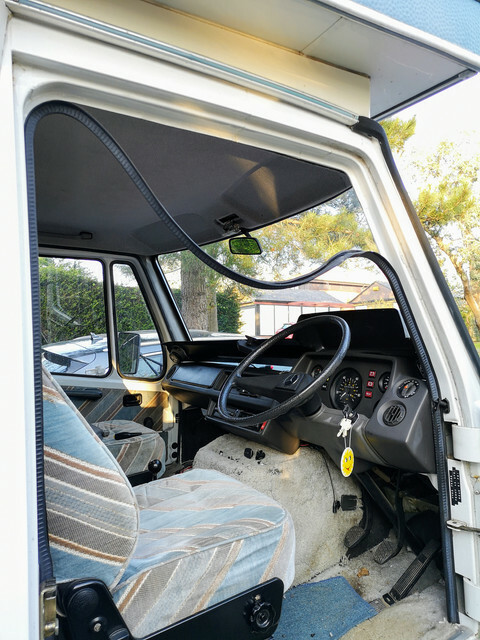 Currently thinking the best plan of action is to cut a couple of holes in the trim in the locker over the cab and just stick the lights in parallel... they're only 10W so should be just fine that way. That's as far as we got today. Hopefully will get those back in a working state tomorrow and then move on to the next things on the list. Getting the new brake pads in is probably looking like a favourite for the next job. 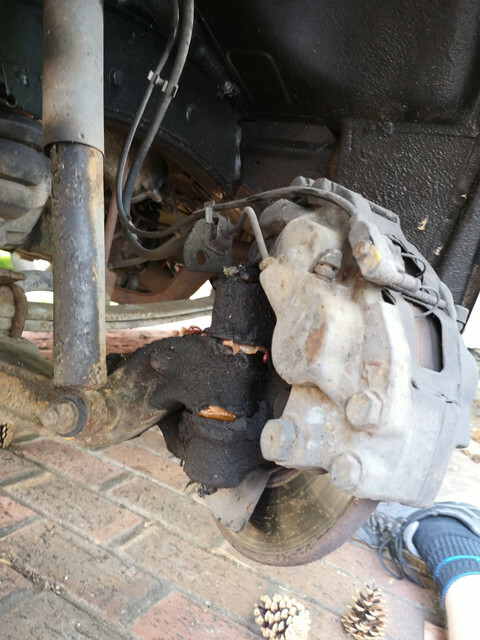 Will definitely need to get the rust in the bulkhead seen to sooner than later won't I.
Hopefully this won't be an issue at the MOT as it should be well clear of any prescribed areas. For now Kurust and Dinitrol will be the order of the day to keep the weather out. Last edited by Zelandeth; Apr 20 2019 at 08:39 PM. Reason: Forgot a photo. This left me with a bit of a quandary. 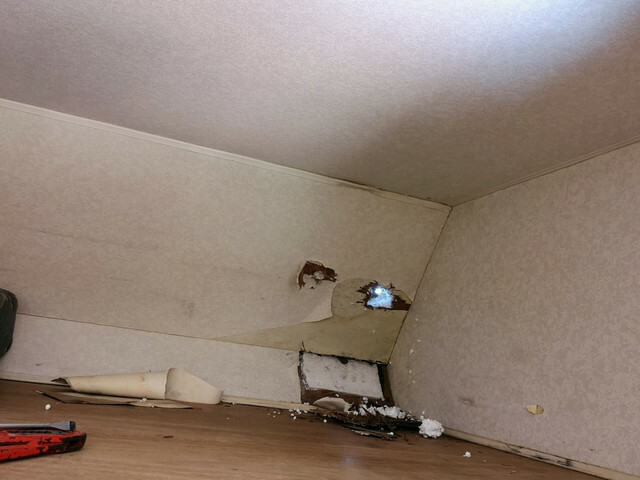 Namely that getting access to that wire - which I couldn't even remember if I had trimmed back as far as I could - meant having to tear apart at least a fair chunk of the upper rear wall in the bathroom, the wall I had just spent a not inconsiderable amount of time building. I did pull apart a tiny bit in one corner to see if I could find the wire by stuffing my hand into the void and grasping blindly. Not a chance. I decided quite quickly to abandon that idea as there was a far easier solution to my mind. Having the lights individually fed from each tail light was a little unnecessary to my mind. Just sticking them in parallel on a single feed seems fine to me. 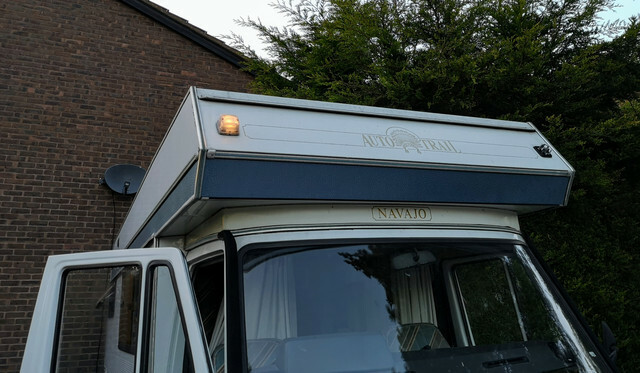 We're walking a pair of 10W festoon lamps (which I will probably replace long term with LEDs - warm white ones before you all jump down my throat) rather than any high power stuff. 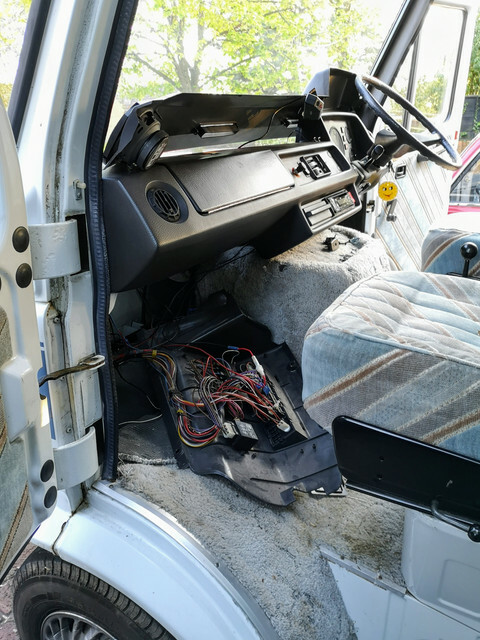 This still left me with some work to do, as being a coach built van, all of the wiring and such was routed long before the interior plywood lining was put in place. Initially I wondered if it might be possible to get the upper front trim panel in the over cab locker off. After spending half an hour in there (and nearly dying of heat exhaustion) I ascertained that AutoTrail weren't messing around. The panels are both stapled to the frame *and* glued in place. It ain't going anywhere. I then decided to take a somewhat more direct (if barbaric) approach as I was done with standing on my head in the locker. 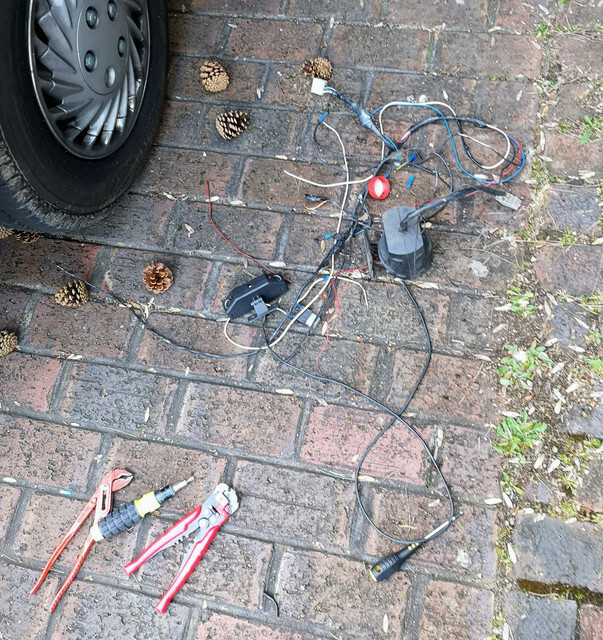 I went round outside, pulled the cover off the lights, found where the cable fed into the van, stuck the screwdriver into that hole then gave it a smack with the palm of my hand, more than enough to punch a hole in the plywood trim inside the van which I could then use as a marker for where I needed to dig out a bit of a hole to gain access. Likewise on the offside - the mess in the corner there is from my earlier attempts to see if I could get the panel off in its entirety. 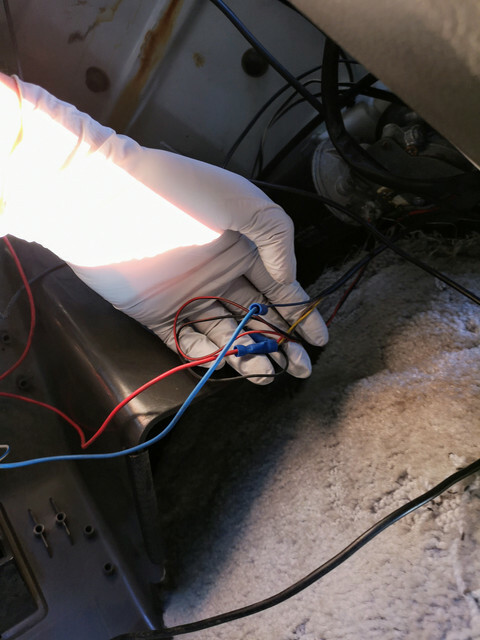 It was a quick matter then to disconnect the original live feed to the nearside light and terminate it, and to wire a link between the two to feed them both from the original offside light. 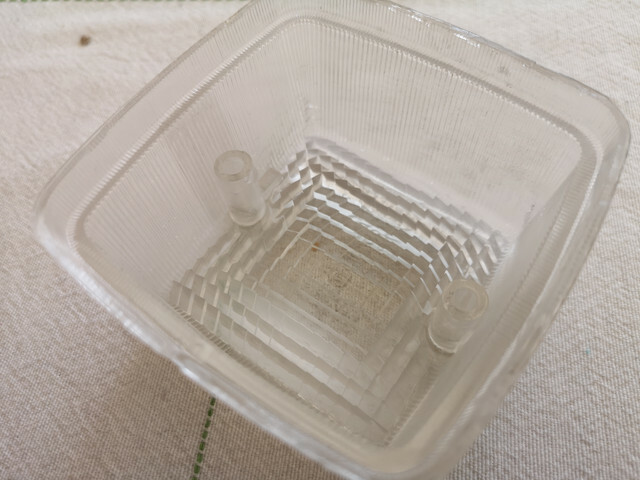 I'll obviously make a couple of little covers to go over the holes and will clip the wire in place. I had taken the lenses off both of them last night to give them a good clean as they were full of pond scum. The seals having disintegrated years ago. There is quite a bit of crazing on them, but they've cleaned up pretty well. 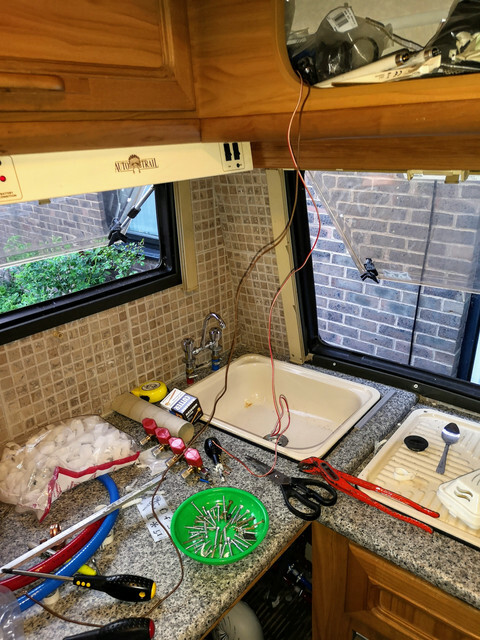 That was half the challenge...I now had the lights ready to accept power and a wire dangling out of the rear kitchen cupboard...however there was a kitchen and a floor between it and the relevant bit of the vehicle loom for me to tie it in to. I decided in the end not to go pulling the walls apart again. I drilled a small hole in the base of the cupboard (it has a lip along the front so it's not visible) having pulled the window blind runner and window trim off, tucked the wire into the void under the trim, drilled another small hole in the worktop (again hidden by the window trim), and routed the wire down to the space below down the cabinets. Then I had it follow the sink waste pipe through the floor. No it ain't pretty. This is a job I can definitely see me coming back to at some point in the future (I'll need to open the walls up really when I reinstate the high level tail lights) but it will at least get the lights working for now. 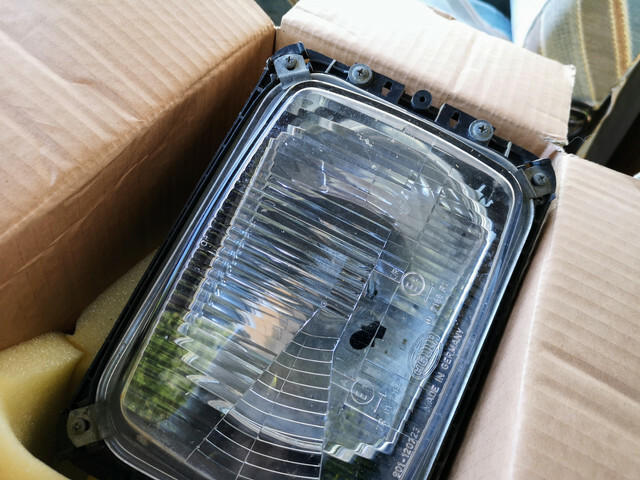 Once I got it that far I just pulled the offside tail light cluster out and put a piggy back spade terminal on this side and hooked it up to the tail light lamp holder. Glad to see they seem to be fully weatherproof as there was zero signs of water ingress inside the cluster. The moment of truth of course was to see what would happen when I turned on the headlights. Hard to see in such bright sunlight, so here's one from a few hours later. Much better! Seeing that pleases me far more than it probably should do. 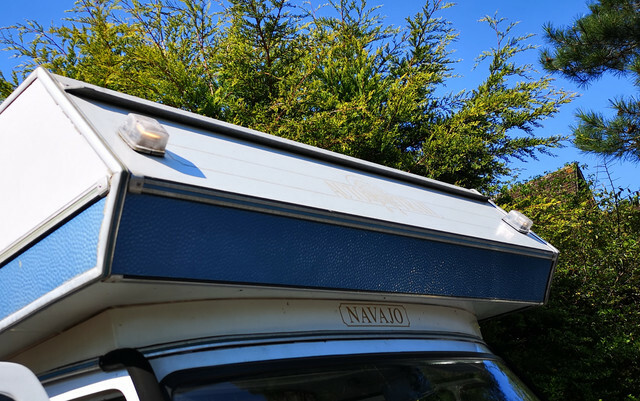 On the subject of lighting (as it seemed as good a time to do a full check on it with the MOT coming up and all that) I found that the nearside front indicator was out. New lamp time. This should be a ten second job, if it wasn't for the stupid poorly fitted alarm wiring getting in the way yet again. This thing had been annoying me for months. The entire installation was a mess. This nonsense floating around in the fusebox for a start. The only fusing to the whole thing being in the *ground* connection didn't instill confidence either. Twenty minutes later the engine bay looked a good deal less cluttered. This is the pile of rubbish that was removed. 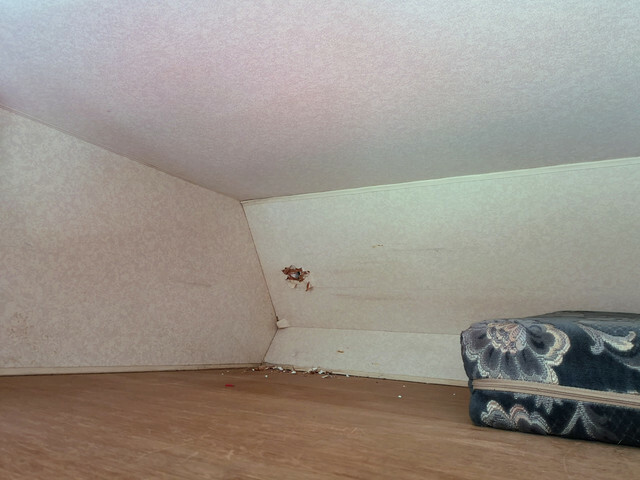 The interior could then be put back together. 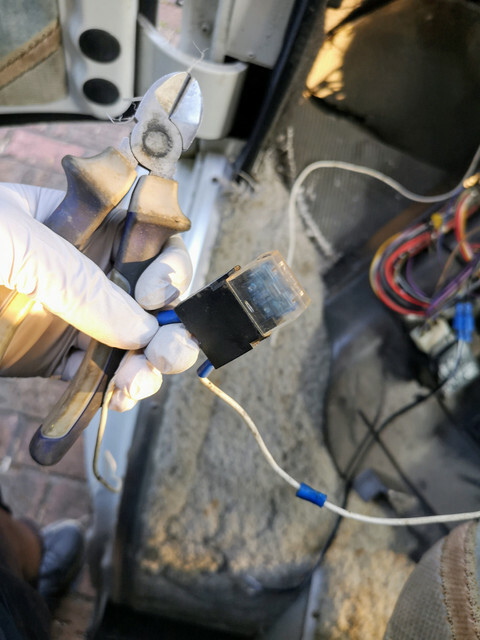 Having tidied up the wiring behind the fuse box meant it was far easier to get it back in place this time. Also hopefully has put an end to getting wiring stuck in the seal when putting the engine cover back in. 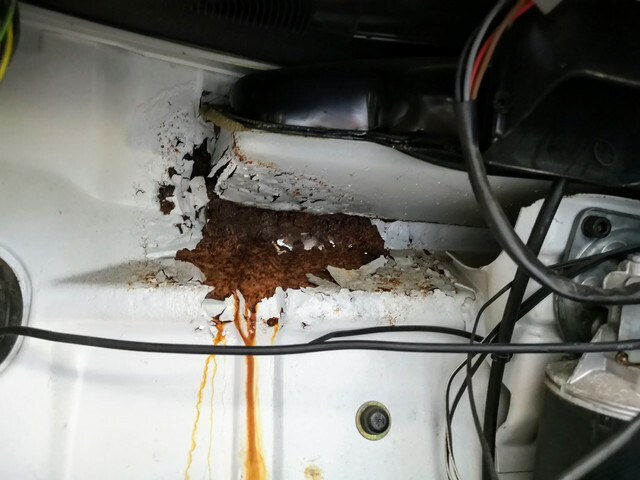 Before I buttoned that up I drowned the whole rusty area under the heater intake with Kurust. Also put some tape on this area on the engine side to keep any further water out until I have the opportunity to get a new panel welded in. Annoyingly removal of the ultrasonic transducer assembly from the top of the dashboard left three holes. ...So I just stuck that back in place. Not that I think a circa 1990 car alarm is likely to be much of a deterrent to would be thieves, it can't hurt. Plus it's a useful thing to attach cameras etc to. It can stay there until I either find something else to take its place or find a dash moulding free of screw holes. 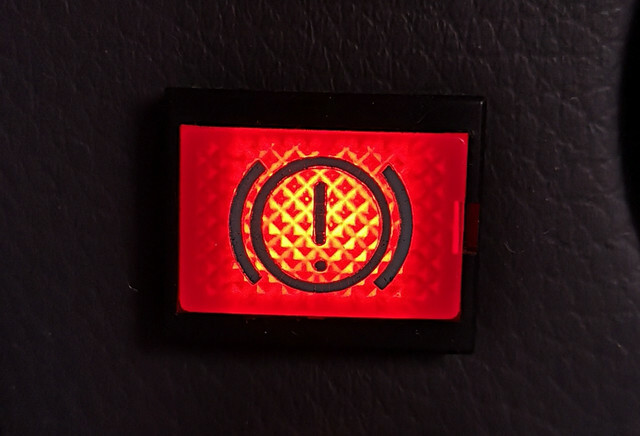 The LED in the dash is staying put for now similarly to avoid leaving a hole. 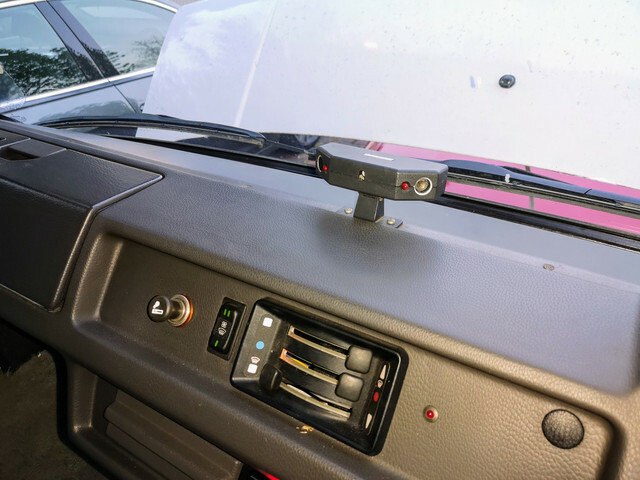 I will be putting an indicator in there to give me a visual indication in the cab of if the power has been left on in the back of the van so I can't forget to switch stuff off before leaving the van or driving off. 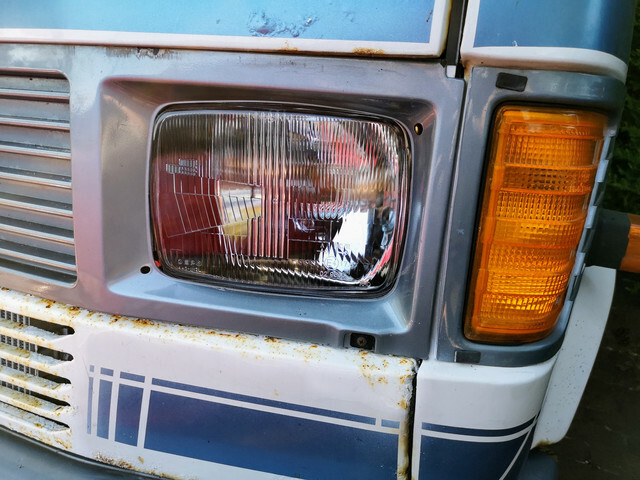 The nearside indicator repeater lens is in dire need of a good clean as like the lenses of the marker lights it's been full of pond scum and rust. 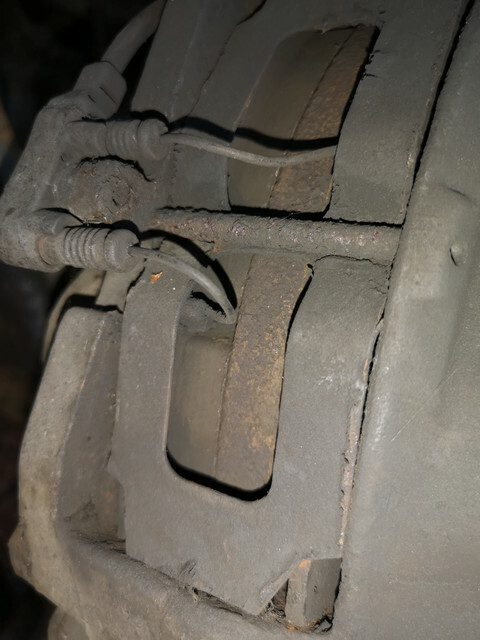 Brake pads next. First challenge there will be seeing if I can get the wheel trims off in one piece - if not it will be all the more excuse to bin the horrible things! Have been putting it off for long enough...time to get the brake pads changed. Have to admit to being hugely impressed by this tiny little jack. Two aspects. Firstly is that it lifted something the size and weight of this van effortlessly. Secondly in that it's cleverly designed so it slots securely around the suspension leaf (or axle tube at the rear). 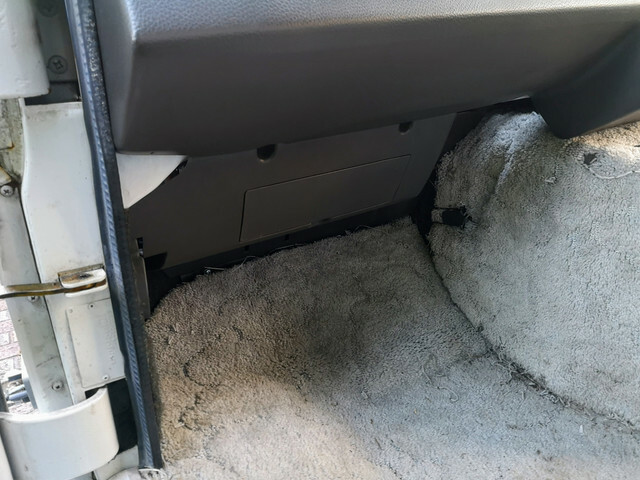 This also makes the jacking process far less unnerving as you don't need to lift the thing feet into the air - literally about an inch has the tyre clear of the ground. 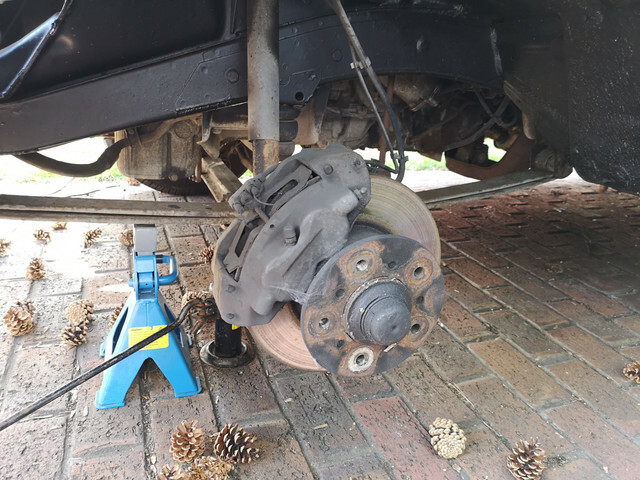 Very glad that I bought the rattle gun...very much doubt I'd have got these wheel nuts out without it...to say they were tight would be a massive understatement. It's pleasing how substantial everything on this is when you're used to working on cars. Nice to see the discs are obviously pretty decent, no lip at all. ...I thought we were dealing with a worn out set of pads. Not a set that's barely used. Oh well, got a good opportunity to check things over while the wheel is off. 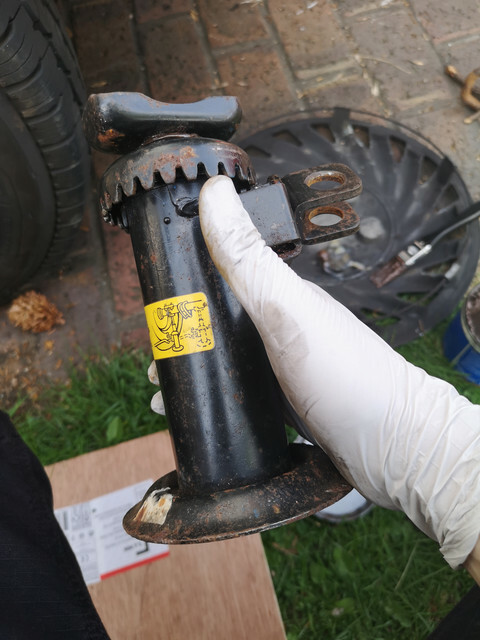 Grease gun was brought in and the kingpin given a good shot of grease (yes I did wipe the excess off before I put the wheel back on). Annoyingly I almost immediately spotted more MOT work though. 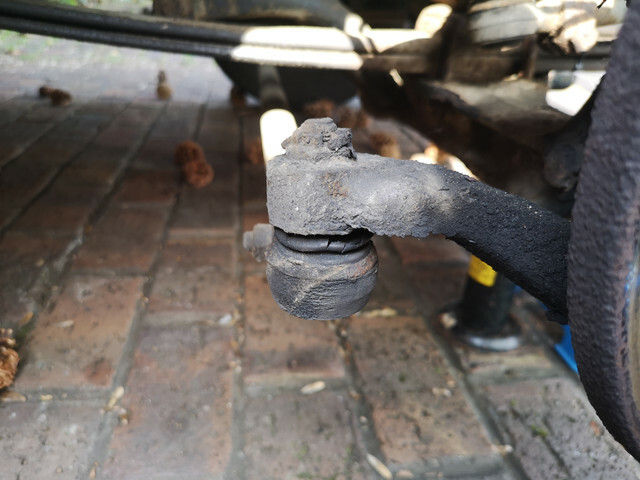 The track rod end ball joint dust cover is knackered. 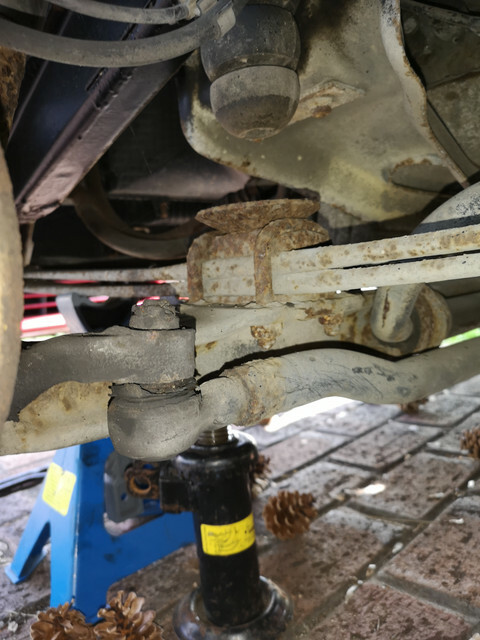 That's one substantial drop link! Everything else over this side looks okay to me. Bit of rust on the brake hose ferrules, but they've got another year or two in them I reckon. Hoses themselves seem nice and supple still with no perishing. Can't see anything awry with the wiring to the pad wear sensors in that the wheel arch. Have the hub a good brush down and painted the wheel surface with copper grease as per my usual practice and put things back together. Then on to the offside wheel. I was slightly worried given the new pads in the nearside but the perpetually flickering brake light on the dash that I would find that someone had only changed the pads on one wheel (wouldn't be the first time I have found that!). Gave the kingpin on this side a good dose of grease while I was there too. 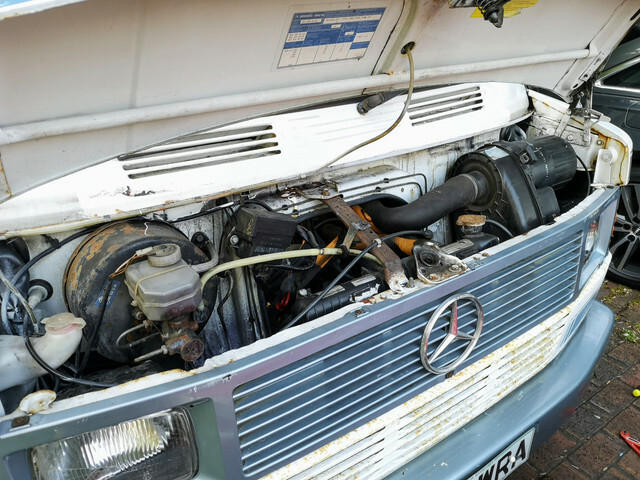 This is something which is often neglected on these old Mercs. 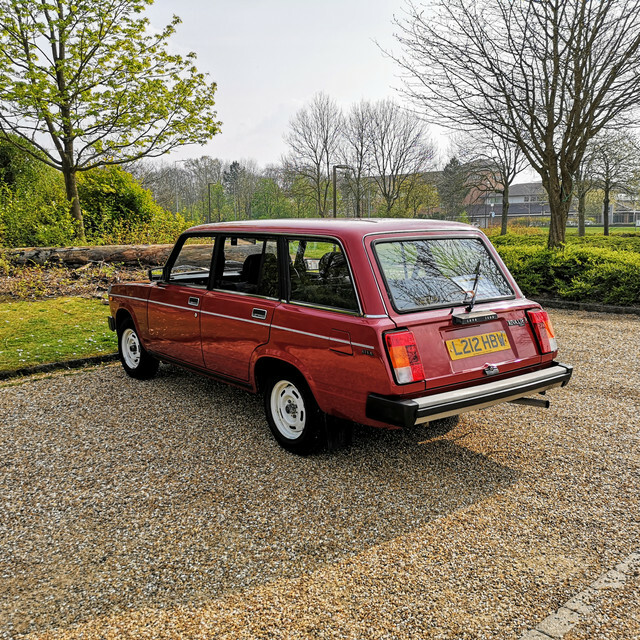 The steering should be lovely and light once you're on the move (especially if it's got the correct tyres on) though it's inevitably fairly weighty when parking! Annoying to hear of people having to do major work due to wear in there for the sake of a 30 second bit of service work! 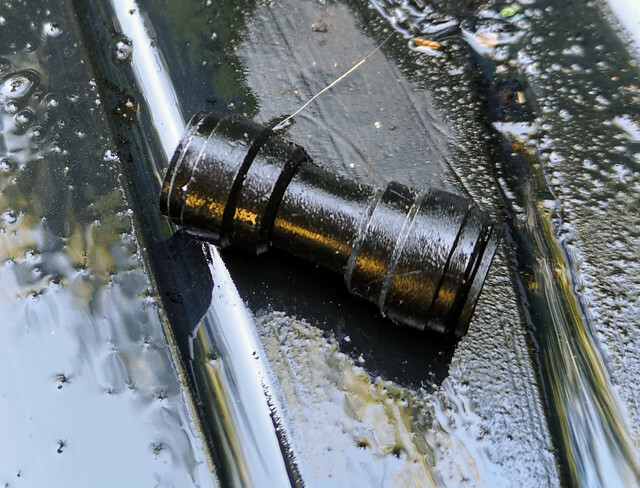 Hey look...another stuffed track rod end. Not too bothered about those as track rod ends are hardly going to break the bank. 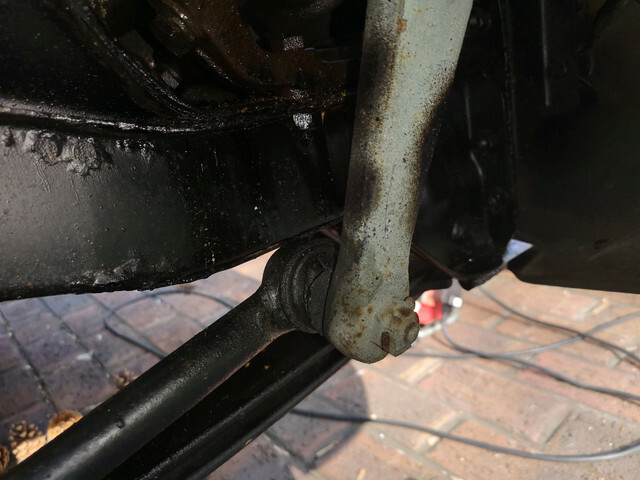 The other split dust cover however is on the steering linkage from the steering box (I believe drag link is the correct term?) which is rather more annoying as I expect this is rather more expensive. This one I actually knew about beforehand so not a huge surprise. There's a little bit of play in one of the joints as you can hear something very faintly going "dunk dunk dunk..." when you rock the steering. Can't see where it's coming from but given where that is it's a prime candidate. Don't *think* it's one of the track rod ends as I can't feel anything in the way of movement at the wheels. Looks like my local Mercedes dealer will be making some money out of me tomorrow then. Yes I could probably find stuff a bit cheaper on eBay (etc) but the parts desk at our dealer has been really helpful so far. 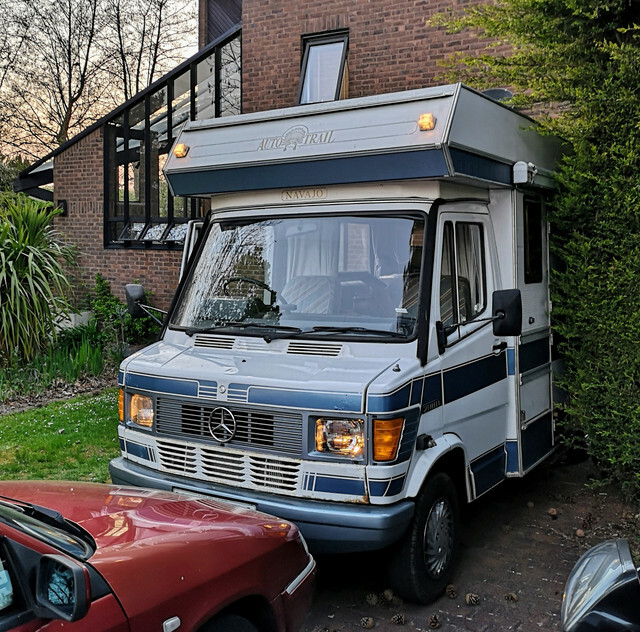 Plus Mercedes seem to have really good heritage support and I'm more than willing to pay a few quid extra to show that is owners appreciate that. Depending on how time goes I might fit those things myself...though I'd rather get the garage to. I generally avoid steering and suspension work if I have any choice these days. 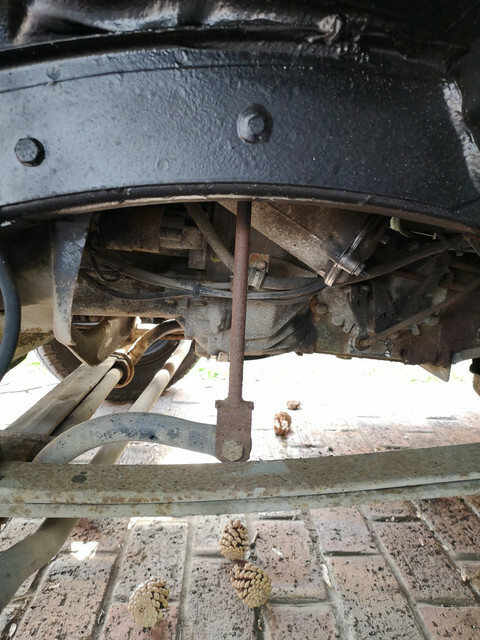 I've played the "the ball joint appears to have been welded in place and I've immobilised the car trying to get it out" game enough times to learn that throwing it at someone with a four post lift, serious ball joint splitters and oxy-acytaline on hand is far less stress. Not too worried about that. This however requires more thought and some time spent with my nose buried in a wiring diagram. The pad wear sensors appear fine and the pads have a good 1/3" of friction material on them. No the fluid isn't low either and the float is floating. Hmm...time to have a think. Some folks have given me a couple of garages who should be able to do a test on the van so will give them a shout tomorrow. Still finding this quite nice to work on though. The fasteners are all good quality and most things are nice and chunky, *usually* easy enough to get at too. 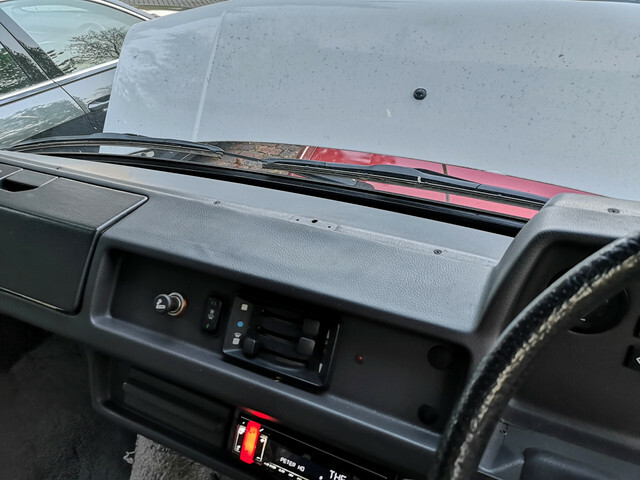 There are exceptions of course too...see offside front indicator swap which requires you to remove the headlight - which requires you to remove the radiator grill.